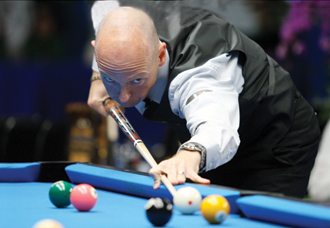 Souquet, Fisher capture gold medals in 9-ball as cue sports take the stage at the World Games. THE OLYMPICS, it is not. But as far as the 64 cueists in three disciplines that traveled to the 2009 World Games are concerned, it's the next best thing. The quadrennial event features 31 non-Olympic sports - including the pool, snooker and caroms. And, with some cue sports struggling to gain international recognition as true athletic endeavors, the World Games are a venue to show officials with various international sports federations and a swarm of media outlets that these sports are deserving of credibility, and - eventually, at least - are worthy of inclusion in the Summer Olympics. So for the players, this event is less about prize money (there's none) and more about the prestige and honor of winning a once-in-four-years gold medal. And at this year's Games - held July 16-26 at the Chung Cheng Martial Arts Stadium in Kaohsiung, Taiwan - Ralf Souquet and Allison Fisher conquered the men's and women's 9-ball events, receiving gold medals atop a podium with their respective national anthems serving as a soundtrack. Again, it may not be the Olympics, but it isn't all that different if you listen to how the players speak about the event. Not one prone to hyperbole, Souquet found yet another way to surprise himself, with a list of victories that continues to grow more and more impressive with each passing year. "This title means a lot to me," he said. "It is probably the biggest achievement in my pool career." That career includes a slew of massive victories, including world titles in 8-ball and 9-ball, a U.S. Open title and five wins at the prestigious World Pool Masters. But the 2009 World Games are a series of events unlike any run-of-the-mill tournament. Making its third appearance at the World Games, the cue sports collected 64 players in the disciplines of pool, snooker and caroms. With nearly 4,800 participants from 105 countries appearing in Kaohsiung, cueists were athletes, just like the power lifters and softball players. "There was such a big hype in Kaohsiung," Souquet said. "Everybody was crazy to meet us as athletes and not just pool players."